Have Yes Re-recorded Fly From Here With Trevor Horn On Vocals? 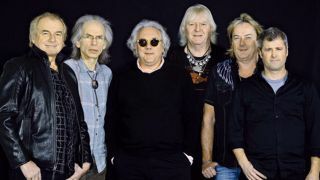 Current rumours abound on the Internet suggest that Yes may be preparing to release a new version of Fly From Here featuring Trevor Horn on vocals. Horn of course produced the 2011 album, that featured then Yes singer Benoit David. David left Yes in February 2012 after suffering respiratory issues, replaced by current Yes frontman Jon Davison. Horn, who along with Geoff Downes won the Outer Limits award at this year’s Prog Awards for their work with Buggles, has appeared live with Yes three times this year, and of course was the singer for Yes when they recorded and toured the Drama album in 1980. The same website also reports that in a June 2016 interview with the North American journalist Mitch Lafon, Yes guitarist Steve Howe, when discussing working with Horn, stated “We have something up our sleeves which are going to surprise some people.” At a show in October 2016 Howe is reported to have referred to a forthcoming project involving Fly From Here, but did not add any details. As we reported back in issue 69, Buggles are working together again and that Howe night possibly be involved in that work, be it studio or live.